Midfielder Dale Stephens admits it is an exciting time as Albion bid to seal promotion to the Premier League. The Seagulls will be promoted today if they beat Wigan (3pm) and Huddersfield fail to win at Derby County in the 5pm kick-off. Stephens said: "We've put ourselves in a very good position. "Wigan are still fighting but we're at home, it's going to be an exciting game for us and everyone is confident. "We've put ourselves in a brilliant position and deserve to be where we are and we're looking to finish the job off. "Whether we go up Monday or not, we want to win every game from now to the end and the manager has instilled that focus in us." 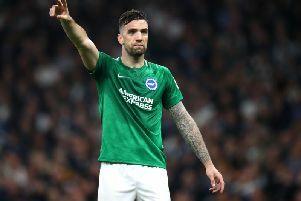 Brighton have won six of their past seven games and Stephens said: "It's massive, it's a big part of the season towards the end. "We finished strongly as well last year, so it's something we've got in our armoury and we're looking to finish strongly now." Albion are four points ahead of Newcastle at the top of the Championship but the title is not a target - yet. Stephens said: "We'd like to get promoted first. The aim of this season from the outset was to gain promotion and that remains our number one target"
As for his future, Stephens, who is out of contract in the summer, said: "There's not news but that's not bad news. I'll speak to the club and the manager at the end of the season when everything is said and done. "I'm solely focused on the remaining fixtures."